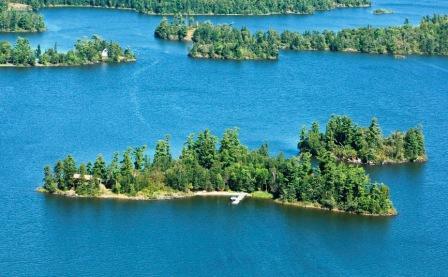 All Package Plans Include The Following: Your own private island chalet with 3 bedrooms, full bathroom facilities plus all linens, fully equipped kitchen, solar power with 24 hour electricity, fireplace in living room, BBQ grill and deep fryer, satellite TV and cell phone coverage. A minimum of 2 guests are required to reserve the cabin. Cabin is nonsmoking. Limited access to our 8 remote lakes. All rates are based on our catch and release plan (shorelunch or dinner fish only). NOT INCLUDED: Live Bait, Fishing License and Taxes. (If you require our boat pick-up and parking services in Kenora the rate is $50 per person round trip). Fully equipped 18’ bass style boat with 50 hp 4 stroke motor, all gas, life jackets, and fish locator with GPS navigation. Boats can accommodate up to 4 people. Children’s Discount – 15% Off for Children 15 Years or Younger. Maximum discount not to exceed 30% per person.